1. DO fly a European carrier if possible. You will have many more choices of final destinations if the second leg of your trip originates in Europe. 2. DO get some euro’s at the airport, as soon as you arrive. Their exchange rates are competitive. 3. DON’T deal with banks if you can avoid it. Generally you have to have an account at a bank to have them do anything for you at all. 4. DON’T take much cash with you, and DO use the ATM’s. They are plentiful and the fees you incur are well worth the peace of mind. 5. In restaurants, forget the 15-to-20% tipping rule. Ten percent is plenty, and then only if you think you have received good service. 6. DO tip your porter after he has taken your bags to your hotel room. Figure one euro per bag. 7. DON’T, if you are over eight years old, order a glass of milk or a cappuccino with dinner. 8. Remember that in Italy the midday meal (‘pranzo’) is the main meal of the day. For an inexpensive but still good ‘pranzo’ DO try a tavola calda on occasion. 9. DO remember to greet people when you walk in or out a shop. ‘Buongiorno’ or ‘buonasera’ are sufficient. This goes for small family-style shops and bars, not for department stores and supermarkets. 10. If you go food shopping in a supermarket DO expect to bag your own groceries and to pay for the plastic bags. 11. If you anticipate train travel, DO take the time to learn the differences between the different train types (rapido, diretto, locale, etc.) Check out the TRENITALIA website for a wealth of useful information and to purchase tickets. 12. When riding trains, DO invest in first class tickets if you’re traveling south of Rome. Otherwise ride in second class. The price difference is noticeable. 13. Before you board a train, DO make sure you validate your ticket at one of the little yellow boxes you see throughout the stations. If you don’t you will be severely reprimanded, and perhaps fined. 14. If you travel by car DO remember that gasoline is expensive, as are the tolls on the Autostrade. 15. When you stop for gasoline chances are the station is fully automated and unmanned. Chances are, too, that some scruffy-looking person will offer to pump the gasoline for you. These people are freelancing, trying to earn a buck. DO let them help you (the automatic pumps can be cryptic), and tip them a couple of euros. 16. When traveling by car, DO stop at an Autogrill. You will wonder why we have to put up with AM-PM stores. 17. DO consider boat travel for some of your itinerary. 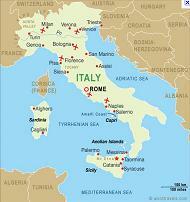 Italy is after all a peninsula with a long coastline, and some of the sights you’ll want to see are best seen by boat. 18. DON’T make your kiddies wait outside if you want to go in a “bar”. An Italian “bar” is more like an American coffee-shop than an American bar.